oud, oud, I need my oud! PHILIP B® Oud Royal – Bounce – Curl – Shine ! Waking up in a blah type of mood needs an instant fix in my book. Hmm, a great hair day ought to fix the blahs. So, I look towards my bathroom and spot the solution PHILIP B® Oud Royal hair products for a triple play! Now that’s a change-up that’ll give my hair some relief. Start off with a clean wash using PHILIP B® Oud Royal Forever Shine Shampoo, the smell alone changes your mood to a happy one. I love this shampoo it has MegaBounce leaving my hair feeling clean, thick and thirsty for PHILIP B® Oud Royal Forever Shine Conditioner for intense hydration. I always try to comb through during conditioning and when out of the shower I turn my head over to comb through again getting any knots out. Now for the BOUNCE – CURL with Philip B. Oud Roral Mega-Curl Enhancer and Oud Royal Gravity Defying Gel mixed together I squeeze together sections I want to emphasize while adding a tiny bit of Oud Royal Perfect Finish Shaping Fiber before the Blow-out! My hair’s full – BOUNCE – CURL – SHINE – & an amazing fragrance. Thompson Chemists and Thompson Alchemists. 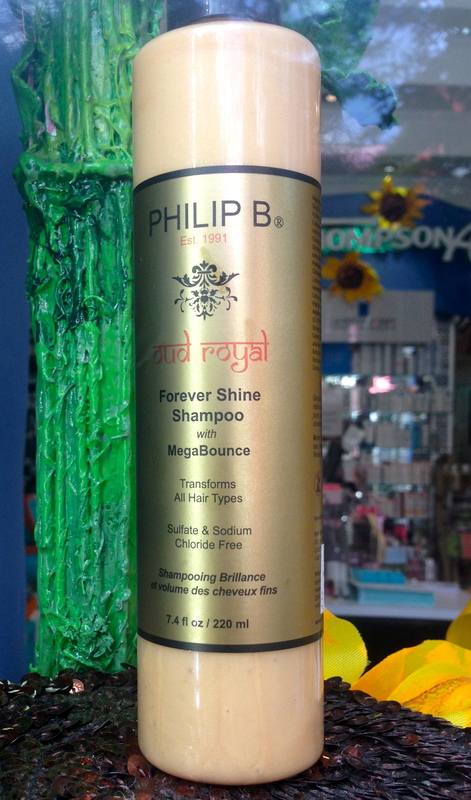 Philip B Oud Royal Forever Shine Shampoo; the first-ever time-released shampoo for MegaBounce and shine that keeps on giving.